Because each client is unique, our programs and courses can be customized to suit your needs and project costs are determined once your needs have been established. We offer training in a variety of fields, including but not limited to: trades, health and safety, Microsoft suite and more. Collège Boréal can deliver the training directly in your workplace through its customized on-site training or in one of Collège Boréal’s specialized laboratories. 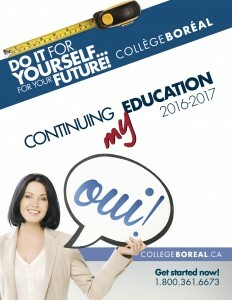 For further information, please contact the Continuing Education department by calling 1.800.361.6673 and ask to speak with a sales representative, or by email at FC@collegeboreal.ca.